What do you love most about shopping atlocally-owned small businesses? Is it shopping with your friends and neighbors? Is it the expert tips and advice that you can’t get through an online retailer? Is it knowing your money is helping support your neighbors and your local economy? Maybe you just love crossing everyone off your holiday list while you sip on FREE wine? 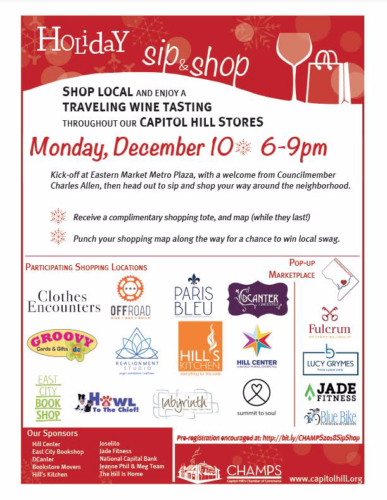 Whatever your reasons, don’t miss Sip & Shop, the annual shopping spree organized by CHAMPS, the Capitol Hill Chamber of Commerce, will be gladdening hearts and warming bodies next Monday, December 10, starting at 6 p.m. Start off at Eastern Market Metro Plaza and claim your complimentary tote and map, filled with goodies from participating stores –and yes, a little swag from us at The Hill is Home, too! Then get ready to walk around and shop AND sip! You can visit Howl to the Chief, Summit to Soul, DCanter Wines, Hill’s Kitchen, Labyrinth Games & Puzzles, OffRoad, Clothes Encounters (I saw Manolo Blahnik’s on the window yesterday), Groovy DC, Paris Bleu, the Hill Center and East City Book Shop. Pop-up stores will be at Realignment Studio, and you can stop by and say hello to us there (we’re really nice!). Kate, Robert and I will be there with some very fun t-shirts, calendars and some of Robert’s books. You can also find Lucy Grymes, Jade Fitness, Blue Bike Studio and Fulcrum Properties Group at the pop-up. As you walk around and visit all the participating stores, make sure you punch your map because you could win local swag! CHAMPS needs you to RSVP, so the wine keeps flowing oh-so-freely all night. Go to this link and tell them you’re going! WHEN: Monday, December 10, starting at 6 p.m.
WHY: Because shopping local is the best…. but shopping local while sipping on wine is, like, a thousand times better!